Basements, garages, sheds and even entire homes seem to accumulate stuff over the years that you might not necessarily want to move with you to another house. It’s amazing how much stuff you will run across before your move and it’s stuff that is unneeded or unwanted. Maybe you picked up items with the intent to repair them or up cycle them and just never got around to it. Renting a dumpster is a convenient way to lighten your load when you are moving. In advance of the actual moving day, there is a lot of stress involved in just making your plans and hoping nothing is forgotten or lost in the process. If you wait until the last minute to start packing your items, it will add even more stress to your situation. It’s best to plan ahead and start going thorough your items well ahead of the move. Renting a dumpster about a month before you move is the best idea. Then as you find clutter or unused items, you can dispose of them as you work through all of the rooms of your house. Booking a dumpster a month in advance will make sure that you have a container available to you. Most families move in the spring, summer and fall, so these are the busiest times of the year for dumpster rental companies. How long you keep the dumpster on site will vary depending on your needs. You may find that a dumpster rental company generally offers a 7-day rental period, but you can make changes to the rental period as you need. The actual cost of dumpster rental before you move depends on your location, the size of the dumpster you choose, how long you keep the dumpster on site and the types of debris, junk or waste that you put in it. 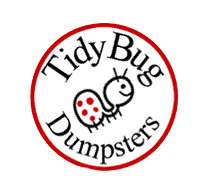 Most residential moves require a 10 or 20 yard dumpster to accommodate the decluttering of an average size home. If you want to get rid of bulky items, such as older furniture and you don’t want to move it with you, then you should consider a 20-yard dumpster. You can dispose of furniture, beds, bookcases, rugs or tables easily in a dumpster, rather than moving it all with you. This will also cut down on the amount of items that you will need in a moving truck and may even enable you to secure a smaller size, thereby saving you some money. Disposal before moving will make loading and unloading the moving truck much lighter without excess items. Dumpster rental companies can tack on some extra fees in certain cases, such as keeping the dumpster on site for longer than first planned, an overage fee for going over the dumpster’s weight limit and dumping hazardous material into the container. Some of the items not permitted are paint, flammable liquids, vehicle tires, automotive batteries of lead acid and other automotive fluids and insecticides or fertilizers. You need to be prepared for your dumpster arrival. Make sure that your driveway or street is clear for when you want the container delivered. If the dumpster is too far from your house, you will wear yourself out making many trips back and forth to it to dispose of items. If the dumpster is delivered in your parking space, you will need to be prepared for parking farther away from your house until it is picked up. These containers can be quite tall. If you are not very tall, consider putting some steps next to the container to make the process much easier on your body when filling the dumpster. The most important reason for planning the pickup date and knowing that date is to make sure the dumpster is removed before a new family moves into the house. It’s best to schedule the pick up about a week in advance of your move out date to get the timing down correctly. Dumpster rental companies may occasionally be delayed in picking up containers, so leaving yourself a buffer of a week between the pick up date and your move out date will be a benefit. So you lightened your load before moving to a new house, but what about the new home location? Some families may leave discarded items behind in a home because they didn’t have a concrete plan for disposal. Often it can be large furniture items or even just some house wares and clothing. When you get to your new home, it’s a good idea to have a dumpster on site here too. You will likely have hundreds of boxes that you need to dispose of after unpacking as well packing materials and you can only have so many garbage cans for your garbage company to pick up. You can rent a smaller dumpster at your new home and break down all the boxes so they are flat to fit a lot in a container. When you are planning to move to a new home, you can save yourself additional stress and strain on your body by renting a dumpster to discard items in before you leave. Most people want a fresh new start to go with the fresh new house. This means getting rid of a lot of old belongings that you don’t use or need anymore. Plan in advance for a dumpster rental and you will be more prepared for your move.